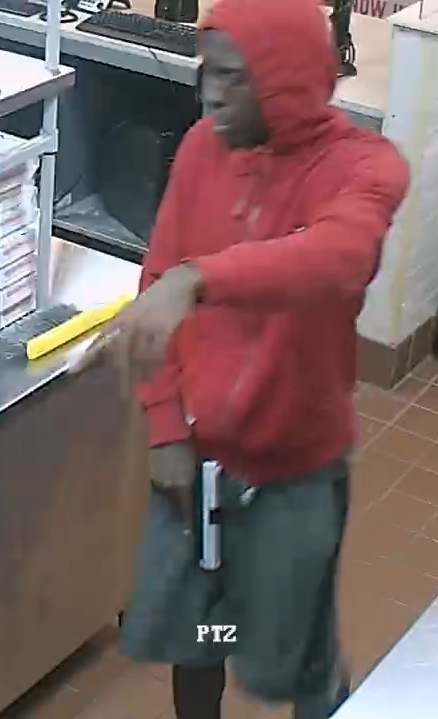 On April 29, 2017, at approximately 12:16 a.m., the Domino’s Pizza located in the 10900 block of North Central Expressway was robbed at gunpoint. The armed suspect pointed his handgun at the cashier and demanded money from the register. Suspect #1 is described as a Black male, 28-31 years of age, 5’9” and 175 lbs. with a dark complexion. The suspect was last seen wearing a red hoodie, gray athletic shorts with a thick black stripe down each side and black tennis shoes. Suspect had a two-tone, silver over black semi-automatic handgun. Suspect #2 is described as Black male, 28-31, 6’2”, thin, dark complexion, with slight chin hair. The suspect was last seen wearing a white t-shirt, long dark shorts, and black tennis shoes. Suspect #3 is described as a Black female, 28-31, 5’9”, 180 lbs., dark complexion, long and ‘tight’ braids with red highlights. The suspect was last seen wearing a pink strapless dress. 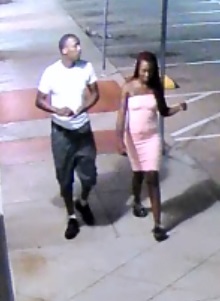 Anyone who recognizes these suspects or has information concerning this offense is asked to contact Detective M. Mulvihill, at (214)671-3705.